Many ideas for great products and services have floundered or have never seen the light of day due to inadequate funding or in many cases no funding at all. Often the originator of the idea may lack the resources to develop it into an actionable business plan to pitch to investors or to apply for a loan. Others may have a great plan but don’t have the capital resources or credit capabilities required to bring their idea to life. For those looking to create the next great service or produce the next big selling gadget there are several alternative paths to funding a small business. Since the early 2000s, online lending companies have advanced into a realistic option for small businesses seeking loans not otherwise obtainable through traditional banking. Online lending has matured as a path for borrowing and has attracted many larger companies looking to diversify investment options for shareholders. As this market matures and scales, the need to stabilize risk and improve transparency will bring even more opportunity for online lending and allow continued growth as an industry for those seeking capital. With the willingness to take some additional risks, as well as friendlier lending terms compared to traditional banking, the arrangement has worked to the benefit of both lending investor and borrower and has improved options for those seeking funding online. Small businesses may benefit from looser credit requirements and fewer restrictions on the use of the funds while paying higher interest overall. However, for those facing the possibility of no funding, these companies can provide the available capital to get a business off the ground, on to the next level or provide relief for short term cash flow shortages. There are two types of online lenders to consider – direct lenders and lending marketplaces. Direct Lenders: Deal directly with the applicant business and lend money or extend lines of credits based on business health. Lending Marketplaces: Utilize an investor pool and risk and credit assessment to determine eligibility for a loan. The funding of the loan itself comes from a single source or a combination of investors within the investor pool who have determined that the risk is worth the return. Another potential online source for securing business funds that has gained a lot of press in the last few years is crowdfunding. This path is one of the most flexible and represents the ultimate democratization of a product or service. The funding is provided by “the people” and as much as it can help a new business get off the ground it can also be an early indicator of the popularity of a specific new product. 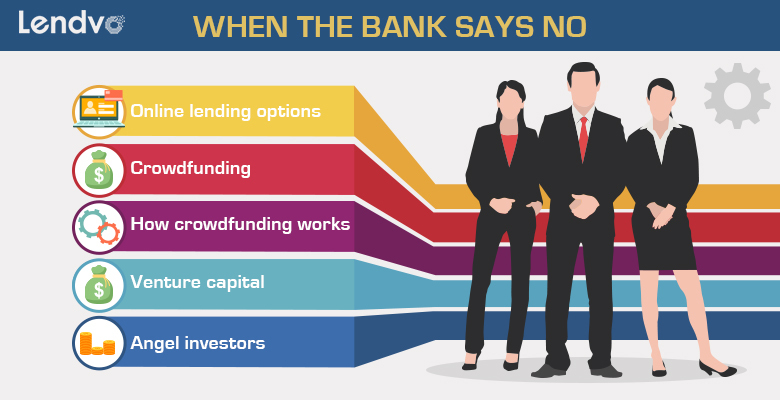 Unlike online lending, crowdfunding can help raise funds and working capital without the requirement of repayment of a loan or the burden of a credit assessment. However, this method is best for accomplishment of a single product or service launch. It is not generally used to raise general business capital or fund a startup at the enterprise level. Of the many crowdfunding sites on the internet today the two best known are Kickstarter and Indiegogo. Entrepreneurs, or those wishing to start their business with the launch of a single or specific product or service idea start a “campaign” on a crowdfunding site. Funding is encouraged by offering “rewards”. In the case of a physical product the reward can be a unit of the newly produced gadget. For services or creative products, the reward can be a subscription, performance or some form of recognition to funders. Funds are generated at different levels toward a goal required to make the product or service viable or some milestone of production of the good or service achievable. Options vary among crowdfunding platforms. Funds can be “all or nothing”, with the funds returned to the funders if the product doesn’t reach the goal, or acceptance of partial funding if the campaign falls short. Venture Capital is a path to funding for new products and ideas where a high rate of return is sought by the investor. While there are venture capital firms specializing in different types of industries there has been a surge in recent years for venture capital funding in high profile industries such as 3D printing, virtual reality and in tech based companies leveraging the power of the internet and the use of the “On Demand” or “Gig Economy”. Venture capitalists are drawn to industries poised for growth and with a high rate of return possible on their investment. They are often accessible once a company has a firm business plan, a clear strategy for scaling and a viable business performance in terms of sales. The upside to the startup or high growth business can be a substantial increase in working capital for new products, research or scaling. The downside for a company pursuing a venture capital investment is that venture capitalists often expect a significant amount of say in the direction and decision making in a company as well as a rapid return on their initial investment. The decision to pursue or accept an offer from a venture capitalist should be considered not just in terms of the dollars it will bring, but also in terms of the control the founder or founders may have to cede to see their vision fulfilled and their company move to a higher level. Closely related to venture capitalists are angel investors. These are often high net worth individuals (HWNI) willing to come in at earlier stages of development for startups with a direct investment in the company. They can provide much needed capital and allow the principal to focus on core business aspects such as product design, sales, marketing, management and cash flow. While the arrival of an angel investor can resolve the headaches of “bootstrapping” it does have some drawbacks. An angel’s participation is predicated on a high rate of return usually within three to five years or a strong equity position of as high as 25% or higher, or both. It may also include ceding some decision-making authority or at the very least requiring consultation before making critical decisions at the enterprise level. One funding trend in recent years has been the arrival of companies that provide microloans. While a large portion of funding focuses on lending at the macro level, many small businesses and sole proprietorships don’t need tens of thousands of dollars in funding and can launch and grow their business organically for considerably less money. In many cases, the launch of a new business can hinge on securing just a few contracts or in a single small equipment purchase. Microlenders are generally non-profit organizations that deal with loan amounts for businesses too small for consideration through traditional commercial business lending entities. Microlenders offer smaller loan sizes, usually require less documentation than banks, and often apply more flexible underwriting criteria, making them a more “right sized” funding option for many smaller businesses. For small businesses and startups facing a long stretch on cash flow due invoice terms agreed to with retailers, selling receivables up front can provide necessary funding. The easement of the financial burden of invoice terms for a retailer purchasing the finished product, and the payment by the producer on supplies and raw materials at terms significantly less than the retailer invoice payment terms can create a disastrous gap in cash flow. Selling receivables, or “factoring” can help close or eliminate this gap. While this path does cede some net margin to the factoring entity it can solve a lot of headaches, especially if negotiated terms with retailers are long. However, despite the expense, competition for factor rates are improving with the emergence of companies such as The Receivables Exchange where companies within the exchange can bid on receivables and offer better rates for this method of borrowing than in the past. Of course, no discussion of funding paths for small businesses would be complete without mentioning the Small Business Administration. This government backed loan program is still a viable option for many entrepreneurs and small businesses. Criteria for approval is specific and includes being turned down for funding by a traditional bank or other lending entity. You will also have to meet the government definition of a small business as well as other criteria to be approved. But the SBA is still an option to consider for many businesses seeking to secure funding. The competition and environment for starting and growing a small business over time has traditionally been difficult and remains so today. Over 50% of small businesses do not survive past their fifth year. And of those that fail, 82% of all failed businesses fail due to lack of cash flow. With stakes this high it would be prudent for any small business owner, startup or potential entrepreneur to be aware and consider all funding options both traditional and alternative.